While the Red Sox were in the late innings of their West Coast game against Seattle, the team announced their first move of the trade deadline acquiring utility player Eduardo Nunez from the San Francisco Giants for right-handed pitchers Shaun Anderson (pictured) and Gregory Santos. Anderson is currently 17th on the SoxProspects rankings, while the 17-year-old Santos was unranked. Nunez has played in 76 games for San Francisco this year, hitting .308/.334/.417 with four home runs and 18 stolen bases. He rarely strikes out or walks and lacks power. His average is driven largely by BABIP and inflated by his speed. Defensively, Nunez has played primarily third base but has spent some time in left field, right field and at shortstop. Nunez doesn’t grade out very well on the advanced defensive metrics, with negative defensive runs saved at every position he’s played this year and -2.0 defensive WAR according to Fangraphs. While Nunez doesn’t seem like a major upgrade offensively or defensively, his speed does bring a new dimension to the Red Sox bench that it hasn’t had in a while. Nunez stole 40 bases last year and his 18 this year would lead the team, one ahead of Mookie Betts. Another motivation in acquiring Nunez was likely his salary, which was relatively low among the rental players available. The Red Sox will be on the hook for just $1.5 million for the rest of the year, which leaves them with room to make more deals while staying under the luxury tax. Nunez did come at a cost, however, as Anderson has established himself as one of the more intriguing pitchers in the second tier of the system, and Santos represents a lottery ticket with solid statistics in the DSL. The primary piece heading back to San Francisco is Anderson, the Red Sox 2016 third-round pick out of the University of Florida, where he'd served as the club's closer. 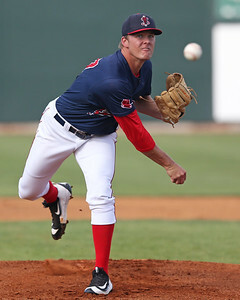 Anderson signed for just over slot at $700,000 and immediately transitioned him into the starting rotation, but in his 2016 debut with the Lowell Spinners he allowed 12 hits and 9 runs in 2 2/3 innings before being shut down for the rest of the regular season. I saw both of Anderson’s starts last year, and it was clear he wasn’t comfortable in a starting role, though he did get somewhat unlucky also with a number of weakly hit balls dropping in. In Spring Training this year, Anderson looked like a different pitcher and seemed a lot more comfortable on the mound. His stuff looked better and he carried that improvement into the regular season. He excelled with Greenville in seven starts, throwing 38 2/3 innings with a 2.56 ERA and 1.06 WHIP. He allowed 30 hits and 11 earned runs while striking out 37 and walking 11. Following a May promotion to Salem, Anderson took a few starts to get adjusted but has excelled of late with 21 strikeouts and only two walks over his last 18 innings. Overall with Salem, Anderson had a 3.99 ERA and 1.21 WHIP over 58 2/3 innings with 48 strikeouts and 18 walks. Anderson has a prototypical pitcher's frame, listed at 6-foot-4, 225 pounds. He is a solid athlete on the mound and has some projection remaining, especially in his lower half. He starts on the third base side of the rubber and throws from a three-quarters arm slot with a long arm action. Anderson uses a four-pitch mix, featuring a fastball, slider, curveball, and changeup. His fastball sits in the low-90s and touches the mid-90s. He has shown the ability to control the offering, but his command comes and goes. The pitch is heavy and shows sink when he keeps it down in the zone. Long-term, it projects as a plus offering. Anderson’s best secondary is his slider, which will flash plus potential. At times, the pitch has looked like a cutter, but this year it has developed into more of a true slider in the mid-to-high-80s. He has confidence in the pitch and does a good job of eliciting weak contact with it. Anderson threw his curveball 77-78 mph when I saw him last year, but didn’t throw it when I saw him in spring training this March. The pitch showed a long, 12-to-6 break and tight rotation when he snapped it off. He did throw his changeup this spring, albeit sparingly, in the mid-80s with the pitch on the firm side. Last year, he threw the pitch 81-83 mph and showed some feel for the offering. Overall, with strong pitchability and a four-pitch mix with two potential plus offerings, Anderson has a chance to start long-term. He has the frame to handle the rigors of a starter's workload and could develop into a solid back-end starter, though he doesn’t have a high ceiling. If things don’t work out in the rotation, his fastball/slider combination should play in a bullpen role, something with which he is familiar from college. Though Anderson wasn’t one of the top pitching prospects in the system, he fell into a second tier with the likes of Mike Shawaryn, Darwinzon Hernandez, and Roniel Raudes. Given Boston's inability to develop homegrown pitching and lack of depth, he is a reasonably high price to pay for a rental player. Given the Red Sox' struggles at the major league level, it is clear they felt a move needed to be made, and Nunez does represent an upgrade if used in a utility role. However, if Nunez is used in an everyday role he represents a marginal upgrade, at best, offensively and a downgrade defensively. The other player heading to the Giants is 17-year-old Dominican right-hander Santos, who signed for $275,000 back in August 2015 on his 16th birthday. Santos made his debut in the Dominican Summer League last year and put up a 4.17 ERA and 1.61 WHIP with 26 walks and 25 strikeouts in 41 innings. He wasn’t brought stateside for either the Fall Instructional League or minor league spring training and was assigned back to the DSL this summer. In seven starts, he has thrown 30 innings and yielded only three earned runs on 21 hits on 15 walks while striking out 21, good for a 0.90 ERA and 1.20 WHIP. Because he had yet to come stateside, we had not had the opportunity to see Santos in person. Although he was repeating the DSL, Santos was very young for a second-year player in the league given his late birthday, representing a lottery ticket a long way away from the majors.